The choice of the climatic room suited to your needs is often a very complicated task. So, to help our customers to clarify the main aspects to be taken into consideration and succeed, therefore, to select the most appropriate climatic chamber, we have decided to collect the most important information able to make the customer understand the main functions of a climate chamber and to facilitate the choice of the product. To make the choice of a climatic chamber clearer and more linear, it is necessary to understand these factors ang how they can help the customer to make a decision as quickly as possible. Furthermore, the acquisition of this knowledge can greatly simplify the selection of a climatic chamber. The two basic elements to start from for making the right choice are the features of the specimen and the type of test to which it will be subjected. 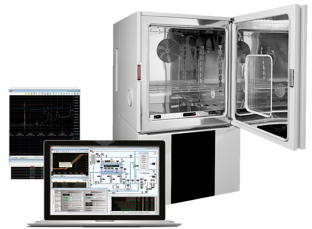 There are countless types of test chambers for environmental testing, each of which is available in different configurations, designed to meet the specific needs of the users and/or the most important standards. The more information is available, the easier it will be to find out which product best suits your needs. WHICH TESTS CAN BE PERFORMED? There is a very wide range of environmental tests: thermostatic, climatic, corrosion, vibration, altitude, thermal shock, etc… These tests are often described in specific industry standards (IEC, DIN, ISO, etc.) or proprietary standards (FCA, FORD, ESA, etc.). WHICH TEMPERATURE VALUES CAN BE REACHED IN THE CHAMBER? Without going into detail on the operation of the two different systems, however, it should be specified that the cascade system consists of two refrigeration systems, consisting of two physically separated circuits arranged in series that make it possible to reach very low temperatures. Sometimes a chamber with a cascade system is chosen not because it is necessary to achieve particularly low temperatures below freezing, but in order to have a high cooling speed at low temperatures. WHAT DO YOU MEAN BY TEMPERATURE GRADIENT? The rate at which the temperature increases or decreases inside the test compartment is called the “Temperature Exchange Rate” (expressed in Kelvins or degrees Celsius per minute) and can vary greatly from one model to another, ranging from 1.5 K/min up to 20 K/min. The Temperature Exchange Rate obviously depends on the cooling and heating power installed in the chamber. In other words, the more powerful the compressors are, the faster is the cooling speed and the more heaters are installed in the chamber; the faster is the heating exchange rate. In special cases when high cooling values are required, nitrogen liquid (LN2) injection can be used, allowing a cooling speed of more than 30 K/min. 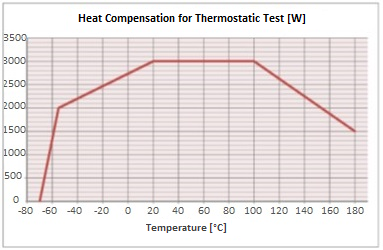 The Temperature Exchange Rate given in climatic chamber technical datasheets usually refers to chamber performance with empty test compartment (i.e. without a test specimen). 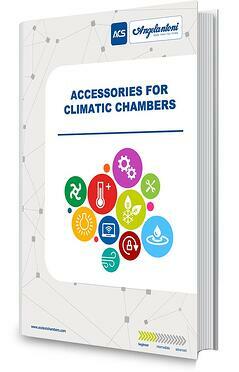 In the climatic chamber datasheet, we find the climatic range, i.e. 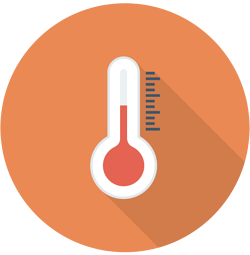 minimum and maximum temperatures within which we can control and adjust the humidity values, which in turn are expressed with a minimum and a maximum value. 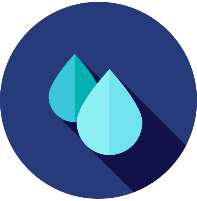 In order to better understand the possible humidity values that can be obtained within a climatic chamber, it is necessary to understand that the relative humidity (RH) that can be reached in the chamber depends on the temperature. For this reason, in order to properly define the climatic range, it is also necessary to refer to the “dew point”. Area 1 indicates the area for continuous tests with a dew point between +4°C and +94°C (Standard Range). 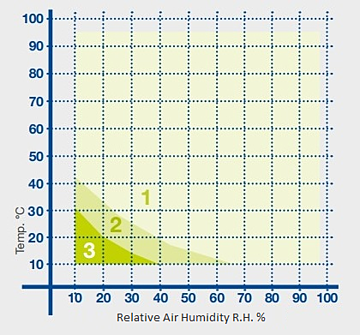 Following the base line of Area 1 we can easily find the minimum humidity value for each temperature value within the climatic range: for example, for T=20° C the minimum humidity value possible within the chamber is RH=40%. Area 2 indicates the temperature and humidity combinations that can be set only for limited periods (dew point down to -3° C for short periods). The T and RH combinations that fall within Area 3 are values that can be achieved with a dedicated accessory for very low humidity tests that consists of a dry air injection system (dew point -40° C). WHAT DO YOU NEED TO KNOW OF THE SPECIMEN? The main information to take into consideration regarding the product to be tested is: size/shape and weight of the specimen. The dimensions of the product allow you to determine the volume of the climatic chamber, sufficiently large to accommodate it comfortably. 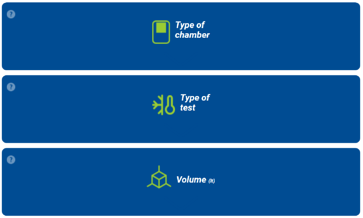 As per good practice, the size of the specimen must not exceed one third of the volume of the test chamber, although special considerations must be made according to the shape of the product to be tested. In any case, the air must be able to circulate freely to ensure that the variation and uniformity of the temperature is almost equal (within the tolerance limits specified by the test) across the entire surface of the test specimen. The mass, and therefore the weight, of the specimen is also a very important parameter, since a large mass could adversely affect the test performance: the performance of the climatic chambers, such as the temperature gradients, are calculated and specified with the empty chamber, i.e. without any mass inside the test compartment. Thus when the temperature exchange rate value required with a test specimen is close to the temperature exchange rate value given in the technical data sheet (with the chamber empty), it is necessary to carry out a check with the supplier of the chamber. Weight is a parameter that must be taken into account for another reason: the shelf in the climatic chamber is designed to support specimens up to a certain weight. Therefore, it is best to check the data sheet to know what the maximum weight for the DUT is. If the test specimen exceeds the maximum allowable weight, the climatic chamber accessories usually include a reinforced shelf or floor. IF THE SPECIMEN DISSIPATES HEAT? When the DUT is connected to a power source (active test specimen), it may dissipate heat. In some cases, this may be negligible, while in other cases it must be taken into account, as it may affect the chamber performance, which as specified in the previous point is usually expressed with the chamber empty, i.e. without mass and without heat dissipation. Thus, when there is an active DUT, the chamber must be able to remove the heat dissipated from the test specimen without affecting its performance, and thus the values of the test that is being carried out. Sometimes the thermal load generated by the test specimen leads to select a certain chamber model in favour of another that is more powerful and with better performance. 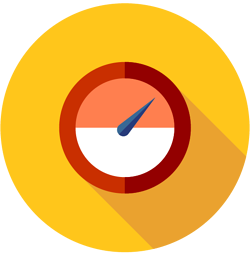 There are also special cases in which the test specimen can release flammable, explosive, toxic and/or corrosive substances, or substances that may create potentially hazardous atmospheres, depending on the temperature range that they may reach. 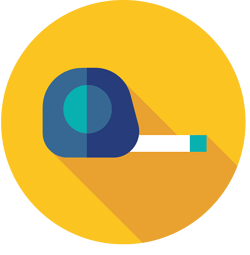 In this case, you have to consult with a team of experts to accurately assess the risk related to the test. 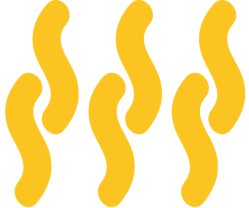 In addition, the subjecting of some types of products, such as batteries, containers under pressure, tanks, etc., to external stresses such as rapid temperature variations or high or low temperature values, can cause unwanted reactions, causing the product to break and causing potentially dangerous situations during testing. "What is a test chamber and how does it work?". If you prefer, you can contact one of our experts and fix a free telephone appointment by clicking below.